A certain level of trust is required to get people to pay attention, take action, share their experience or buy something from a company. Earned in the long-term, trust amongst consumers must be cultivated by an organization and marketing is one means of making it happen. Standing out today as a brand is not an easy task. And it only seems to be getting more difficult as more companies open daily, new forms of media reach the masses and consumers get more careful of what they pay attention to. Trust is a commodity that can help any business differentiate itself and become an integral part of a person’s routine, but fostering it is complicated. 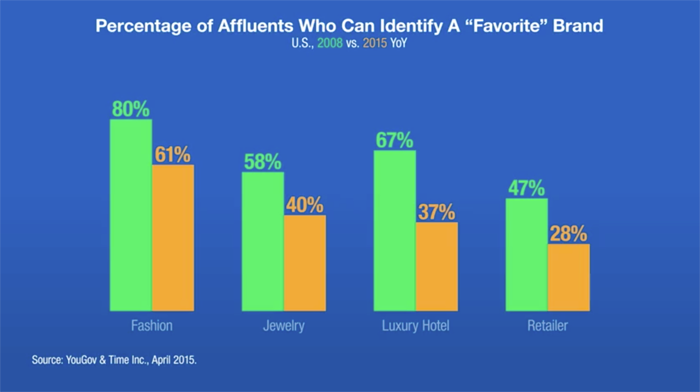 Nobody is walking around hoping for a business to cultivate a relationship with them as the percentage of consumers that can name their favorite brand has decreased significantly. Realistically, people are focused on their own priorities and problems. A brand’s marketing is typically centered on achieving multiple objectives, but the underlying focus of all these efforts should be to establish trust with potential customers. Once a person trusts an organization, motivating them to support the company in a variety of ways becomes much easier since you now have their attention. 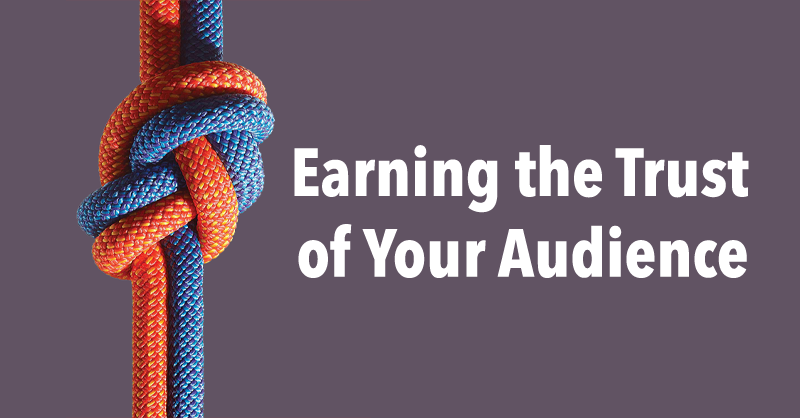 However, you’ve got to continue to work to maintain the trust you’ve earned with an audience as it’s fleeting. 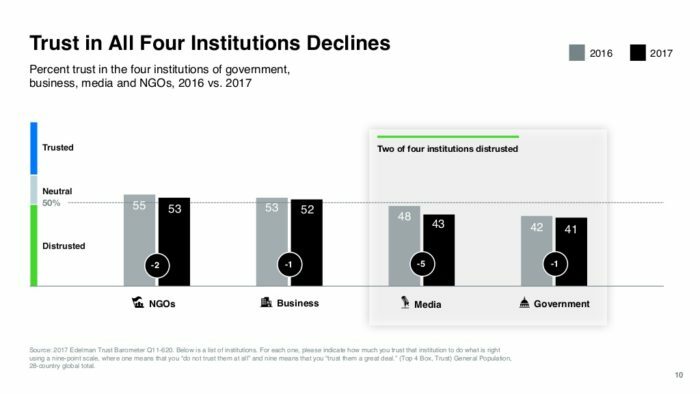 Establishing trust is more important than ever as the 2017 Edelman Trust Barometer found that consumer trust in NGO’s, business, media and government is continuing to decline. It remains the responsibility of an organization to establish, grow and maintain its own trustworthiness with its customer base, otherwise it’s likely to slowly degrade. To develop a company widely trusted by its customers, be aware of how each of the following marketing strategies help build a more credible brand. Everyone is looking for answers to their questions, whether it’s something minor like where’s the closest coffee shop to more complex topics like how to rebalance your investment portfolio. When a person searches on Google or discovers something for the first time on social media, it’s an opportunity for a business to be there and answer their question. 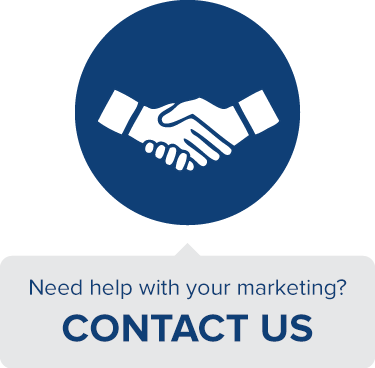 Presenting your audience with quality information on the topics they care about most and in an easy to consume format is how your company becomes a trusted source in a particular niche. Similar to the idea of a mentor providing valuable insight to their mentee based on their experience, companies have the opportunity to become the go-to resource consumers rely on. Blogging, podcasting and creating video are some of the many types of content your organization can create to help solve the problems faced by your audience. Providing the right level of detail to address the topic. How it’s delivered to a person. Provide both original and curated research to support your arguments made in content and be consistent with the information being delivered. Your original perspective is important to include but supporting your advice with reputable sources is essential. Skimping out on quality just one time with an article or a podcast episode is enough to lose the trust of your customers. Understanding what the right level of depth isn’t easy, but it’s the difference between a consumer receiving a helpful takeaway from a piece and walking away scratching their head. To figure out what the right amount of depth to a topic, whether that means word count, the length of a video or otherwise, experiment to see what drives results and what doesn’t. Ideally, cover a topic in the right amount of depth it deserves. I know that’s vague. What I mean is that it is vital to not be so brief with the coverage of a subject that your content lacks tangible value or it’s the same information your audience is already aware of. Also, don’t overdo it by explaining a subject in more depth than it needs to be. Being lengthy for the sake of it makes it difficult for your audience to find the worthwhile takeaways in your content. And do your research to understand where your audience spends time and how they consume information to make the content you’re serving more credible. It’s unlikely that an executive is going to figure out a complicated issue involving sales enablement through a blog post, but an in-depth white paper on the subject might do the trick. Trust isn’t built overnight. It’s cumulative as a consumer needs to benefit from the interactions with your company repeatedly for them to form a memory of how they view your brand. If your company started a blog tomorrow and shared dozens of extremely useful articles on subject-matter relevant to your audience, it doesn’t mean you’ve become a trusted resource. Becoming regarded as a source of expertise takes time as your organization needs to consistently message your audience repeatedly for the long-term to become truly trusted. A study from the American Psychological Association found that repeated messages are often perceived as more valid since repetition makes a concept feel more familiar. Definitely refrain from sharing incorrect or low-quality information repeatedly with the hopes of it coming off as credible as this will eliminate any hope of your company becoming trusted. What you should do as a marketer is consistently publish and distribute meaningful content and messaging of relevance to your audience in the formats that are convenient for them to access. 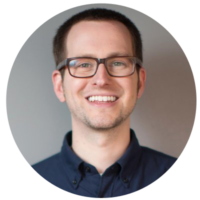 Repetition done correctly is strategic because it strikes a balance of not oversaturating an audience with too much messaging, but communicating enough that you’re not forgotten. My advice here is to practice moderation with your marketing by varying the ways you’re delivering content, ensuring all messaging ties back to your organization’s purpose and experimenting to find new ways of reaching your customer without overextending yourself. For example, Patagonia reaches their audience on a consistent basis through email, a podcast, blog posts, social media and their documentary series all touching upon similar themes. They aren’t inundating their customer base on any one particular channel. Instead, they alter what they are sharing and where it’s shared primarily focusing on their greater purpose beyond selling clothing, which is to support and protect the environment. Patagonia’s marketing efforts certainly touch on the products they are selling, but it doesn’t come off as salesy or promotional as it’s tactfully mixed with content focused on their expertise. The company is seen as trustworthy as they’ve repeatedly discussed and taken action around protecting the environment and communicated their work to their audience consistently. Your organization doesn’t need to be active on that many marketing mediums or have access to a large budget and resources like Patagonia to repeatedly reach your audience with purpose. Emulate their approach by being active on a few different channels, integrating a mix of your expertise focused content with promotional messaging to help spur the trust of customers. When a company speaks up and takes action on issues their customers care about, they are far more likely to be trusted as an organization. According to Berkeley, more than 9-in-10 millennials would switch brands to one associated with a cause as they value companies that are transparent and understand the impact of their operations. Another layer for establishing trust, identify the issues your brand is passionate about and that are relevant to your customers and highlight them as part of your greater mix of messaging. For instance, Shake Shack is well-known for their delicious burgers and milkshakes, but also their high-quality ingredients used in their food, sustainable design practices and their involvement in the communities where their stores are located. Ahead of their store openings in a new city they launch a community-focused project to ensure they have a positive impact on the neighborhoods they’re active in. 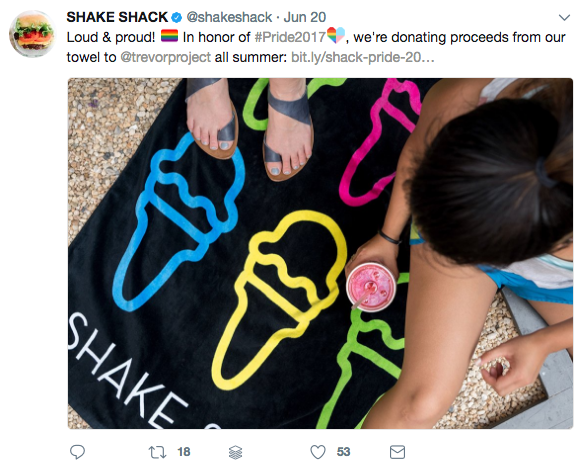 Whether Shake Shack is partnering with a local non-profit or showcasing the work of local artists, the company makes it clear which causes they support across their messaging. To build trust, select a relevant cause that ties back to the purpose of your organization, communicate your support of this issue and take action to make a real impact. In most cases, consumer expectations are pretty low as often they expect to receive subpar service, depending on what they’re paying for like ordering at a fast food joint or taking a flight. Companies often get caught up in seeing everything on an extreme scale when it comes to their ongoing interactions with customers. Many brands think that they need to deliver a world-class experience at every touchpoint or they’ll be put in the same category as airlines that typically offer a terrible customer experience. In reality, delivering a little bit more than a customer expects is what it takes to become trusted and create a loyal customer suggests entrepreneur Peter Shankman in an interview for Nasdaq. Adding a bit more value to each interaction with your customers is attainable for businesses of all sizes, as it is a matter of identifying what would make an experience more personalized. Whether that’s responding quickly to a customer on social media, going the extra mile and paying for a customer’s purchase to correct an issue or knowing a frequent customer by name. For example, I recently bought a new comforter from Bed Bath & Beyond and once I got home and opened it up, it had a stain on it. Super annoying. What was more frustrating is that the store location it was purchased from was over an hour away, which wasn’t a convenient drive to a return a defective product. I reached out to the company over Twitter and they responded in a timely manner with how they’d resolve the issue by allowing me to mail the stained comforter back and get it replaced. 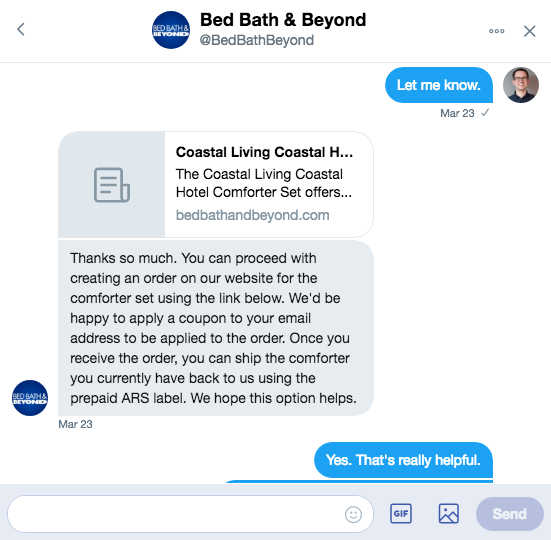 Not only did Bed Bath & Beyond communicate with me on Twitter, where I as the customer choose to interact with them, but they made resolving the issue straightforward. Showing a person that your company cares about them and is willing to put in a little bit of extra effort to deliver an enjoyable experience or correct a problem can help make all the difference. 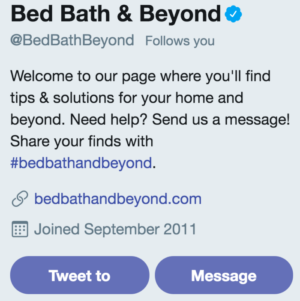 From a marketing standpoint, Bed Bath & Beyond promoted that they provide customer service on Twitter by including copy about it in the bio of their profile. Make it clear where your organization is communicating with customers and set the parameters there, whether that’s sending them to a specific Twitter handle or listing customer service hours. When possible, highlight the moments when customers were pleased with their experiences with your company by sharing them on social media and other channels. 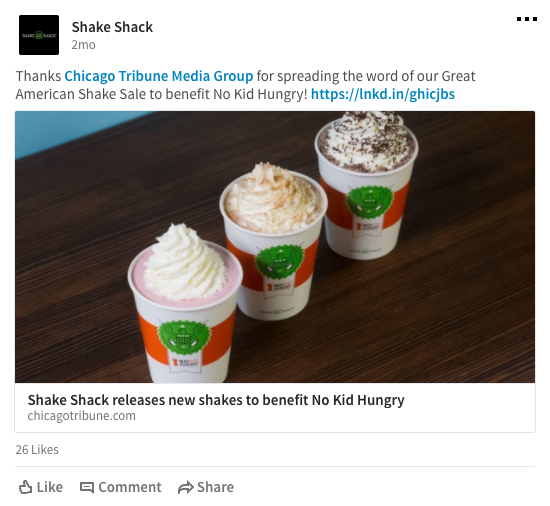 Look for customer enthusiasm shared on social media and promote these posts when appropriate to showcase how your organization treats its customers. Depending on how distinct a particular customer experience is, consider pitching it to the media to increase its exposure. That’s likely what landed additional exposure to Morton’s Steakhouse delivery of a porterhouse steak to a hungry tweeter or the responsiveness of KLM’s dedicated social customer care team. Which aspects of marketing do you think make a company more trusted? How does your organization convince your customers to trust you? Let me know in the comments below.